Twenty-five years ago, Hocking College and Haliburton Forest and Wildlife Reserve met at a wildlife conference and formed a partnership to benefit the students, the College, and the nearly 100,000-acre Haliburton Forest. What & Where is Haliburton Forest? Haliburton Forest & Wildlife Reserve is a privately owned, multi-use forest located in Haliburton County, Ontario, Canada. It's located nearly 270 kilometers northeast of Toronto. In addition, Haliburton Forest hosts tourism, recreational, and educational programs throughout the year and its forestry program is certified by the Forest Stewardship Council. 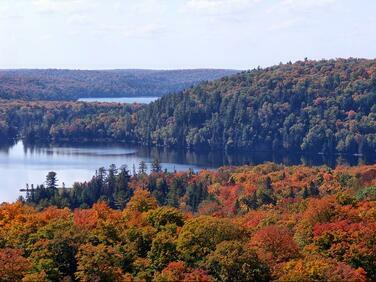 How Many Hocking College Students Have Visited Haliburton Forest? Over the years, more than 400 Hocking College students have made the journey to Haliburton Forest in order to live within the ecosystems they are studying. Each trip provided an integrated curriculum for students studying the northern ecosystems, which includes lakes, forests, rivers, streams, plants, and animals. What Activities Did the Students Get Involved in? Students lived and studied within the northern forest biome in a rustic lake shore camp for nearly a month without electricity, phones, or running water. These five pillars mirror the curriculum the students currently follow, and directly affects the policy decision-making and management practices on the forest lands. Can Students Make This Trip More Than Once? Normally, a group of 12-16 students attend what is known as the "Canada Field School” each year. Afterwards, students who wish to revisit the field school can function as technicians where they're responsible for performing specific duties such as preparing and writing reports. What Subjects Get Covered During the Trip? This format gives students the chance to take other courses as electives that could help them earn a duel degree or even potentially graduate early. Upon their arrival, students meet with the owner, manager, and biologists of Haliburton, as well as representatives from the Ministry of Natural Resources and Forestry from Ontario to learn about the different aspects and goals of Haliburton and the Ministry, and just how Hocking College fits into the fold. At its core, the field school guides students through a series of research-oriented experiments that study the local water and soil. Regarding water, the students monitored the lakes, rivers and streams, sampling fish and aquatic macroinvertebrate populations. They also conducted water chemistry tests and mapped out the physical characteristics of the lakes. In some cases, the students found themselves working alongside professional biologists who provided data resulting in suggestions on how to improve the forest’s management policies of their aquatic systems, and how the forest practices and operations effect the ecosystems in a measurable way. The students also studied and surveyed various mega-fauna such as bears, moose, and wolves, as well as mice, voles, chipmunks, lemmings, and flying squirrels. Before leaving, the students attend a series of lectures for each of the courses, which allows them to concentrate on field studies the entire time they're there. At the end of the trip, students also participate and present to the public an educational seminar on the wolves resulting in the Forest’s first public “wolf howl.” This howl is the kickoff of the summer season for Haliburton and is a very popular and well-attended event by staff and members of the local community. How Did This Trip Influence the Students? Students who took part in this field school got the opportunity to participate in studies conducted by graduate students from the University of Toronto. They also worked hand-in-hand with graduate students from the University of Toronto. Overall, this experience inspired the students to pursue any graduate work-based opportunities they might encounter in the future. Also, upon their return home the students are eager to continue their education and begin taking on leadership roles in their chosen field. Do Many Students Who Make This Trip Stay in the Natural Resources Field? During this partnership, the majority of students who've made this trip have gone on to become successful natural resources professionals. In conjunction, many graduates claim that this trip helped them make several life-changing decisions that influenced both the course of their careers and lives. What’s Hocking College’s Completion Rate For Students Who've Made This Trip? Out of the 400+ Hocking College students that have participated in this field school, nearly all of them have gone on to earn their associate degrees. While many graduates decide to further their education at a four-year school, others have chosen to go straight to work in the natural resources industry. When is the Next Trip Scheduled? The 2019 Haliburton Field School Trip is scheduled to take place from June 3-28, which is already completely booked. Instructors from Hocking College’s School of Natural Resources will also be making this trip, including Ron Cass, Franklin Woitel, Homer Elliott, and Sayre Flannagan. Anyone interested in joining the 2020 trip should contact Ron Cass at cassr@hocking.edu.